nursing was unfamiliar to them; however, they often described the same strong desire to enter nursing as my US colleagues, despite the poor image. Can a calling to nursing develop after someone has been educated and is already engaged in nursing practice? What is the relationship between a calling to nursing and the quality of nursing care? What is the relationship between a calling to nursing and the character of nursing care? Do patients perceive a difference between nurses with a calling to nursing versus without a calling? Does a calling to nursing affect the length of a nursing career? Is there a relationship between nurses with a calling and leadership? How is a calling to nursing conceptualized across diverse cultures? What is the difference between a calling to nursing and a calling to medicine? I was ready to begin research regarding this concept, but I found that while considerable research on calling has been done in the social science disciplines, there is no consensus on how a calling is deﬁned. There is very little nursing literature that addresses the concept, and no nursing studies that attempt to deﬁne it. 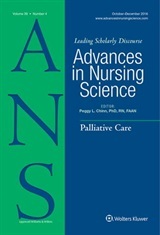 My goal in this article was to analyze the concept of calling as it relates to nursing and develop a deﬁnition with the detail needed to guide reliable research. I look forward to ideas and feedback from my nursing colleagues around the world about the concept of a calling to nursing. Hi Anna – Thanks for your comments about the concept of a ‘calling to nursing’. It’s possible that deep points of knowing could be the origin of a ‘calling to nursing’. That could possibly explain how a calling can develop after someone is engaged in nursing practice. I would be interested in reading your dissertation if you don’t mind sharing it with me. My email can be found with the article. The idea of a calling to nursing, or anything, stem from the experience(es) of Florence Nightingale who was known to claim that she actually heard a voice, in her view this was the voice of “God”, directing her to advance a profession, in the context of caring for the sick. This conceptualization of a “calling” or “vocation” leans fairly heavily on Catholic religious vocation models. I think given the Western white male characteristics of that experience we need to be very careful of privileging the idea of calling, even if we can find corollaries in other cultures. There should be no right reason or route into nursing. I have often heard the debate about motives for becoming a nurse and too often the student who is thought to be inferior because they did not seem to have a “calling”, is the student who is different: male, LGBTQ, person of color, or lower economic status. Thus, I suggest reconceptualizing the idea of a calling so as to remove the White Christian religious overtones before advancing the concept further. From a developing country, nursing has been conceived as a springboard towards a sustained economic gain and such mindset professes that nursing offers more tangible resources for those who seek good opportunities and greener pastures. From a personal note, nursing is a calling of compassion where it views others as caring by virtue of their humanness. From a perspective of a foreign educated nurse, calling to nursing is a response to human suffering, and ailing value system, and debilitating world conflict. Calling to nursing is an emotive phenomenon on how the inner self can be a potent instrument to transform the entire community through a communion of being and synchronic unity of collective-caring. Calling to nursing requires an embodied knowing and an emotional effervescence to see how the world works, accepts the diversity and inclusion, and continue to become a beacon of change. Thanks for your comments about the concept of a calling to nursing. I am particularly interested in your view as a nurse who has worked outside the US. I agree that there are multiple dimensions of calling to nursing. In my research I found that the term is thrown around in our discipline without a consistent definition – which makes good research impossible. I noticed on your CV that you are working at MoH in Oman. I collected data for my dissertation in Oman this spring. I am doing a life history of an Omani nursing leader. I was there the entire month of March. Do you still work in Oman? This comment looks like the writer thinks Christianity is a ‘white’ religion. Quite bizarre. Is that what this means? If so, to correct that thinking – the biggest churches in the UK and South Africa where I trained as a nurse are ‘black’ churches. I have recently financed a young Xhosa girl through her nursing degree at the university of Kwa-Zulu Natal and her subsequent Masters. She and all her family are strong Christians as are many of her contemporaries. I really don’t think she or any of the big churches in South Africa would agree with the above comment. Our Christian churches are made up of Zulus, Xhosas, Afrikaners, English South Africans, Coloured, Chinese, Asians, Vendas, Ndebele and up to 11 official language of which only 2 are ‘white’ languages! I find this comment unfortunately too predictable and prejudiced. The person who wrote this should not seek to promote what I consider a ‘racist’ comment. Christianity is a worldwide religion and the greatest numbers are in Africa – not the US or the UK.